This will be more of a personal review, since I own a craftex ct146 table saw and use it almost daily. I've had it for a year now, so I think I can give a fair and unbiased review based on my extensive use and experience with this table saw. 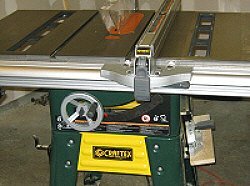 I ordered the ct146 contractor table saw from the Busy Bee Tools outlet in New Westminster, B.C. and received it by truck within two days. I live a good 800 miles away, so I thought this was extremely fast. As a benchmark, the last machine I had ordered from them took almost a week. Cutting Depth at 90 degree - 3 3/8"
Cutting Depth at 45 degree - 2 1/4"
Table height - 36 1/2"
Since my shop is down a flight of stairs in my basement, and the box the saw came in weighs about 280 pounds, I opted to unpack the box up top and bring everything down in pieces. My back applauded the decision. Ct146 contractor saw shortly after assembly and testing. The contents of the carton were individually packaged in plastic bags and packed neatly between thick styrofoam to keep the parts from touching each other. Everything looked in order and undamaged. Assembling the craftex ct146 took the better part of an afternoon, not including checking alignment. The main body of the saw was preassembled at the factory, leaving the stand, cast iron wings, motor assembly, rip fence rails, handwheels, blade guard and a few other miscellaneous parts to be put together by the customer. The craftex ct146 manual suggests laying the saw table down on a flat section of floor to assemble the cast iron wings to the saw's main table. Since I was by myself, I decided to bolt them on after I had bolted the stand to the saw and flipped the unit right side up. The wings are quite heavy, so I clamped a 1 x 2 under the table to provide a ledge to rest the wing on while I slipped on the bolts, washers and nuts. I used shim stock between the wood and wing to help align the extension wing's surface with the table's surface before tightening up the bolts. Using a 36" aluminum level and a .0015" feeler gauge, I checked the main table's surface for flatness corner to corner and in various other directions. The feeler gauge wouldn't penetrate any where I tried it along the surface. Checking the cast iron wings for level with the saw's table showed that the end of the extension wings on both sides of the table were a few thousandths below the table. I tried swapping them side for side, but it had no effect. This amount is negligible though, and has had no effect on the performance of the saw or the quality of my work. The ground finish on the table and cast iron wings is excellent, with only a couple of very minor blemishes that are barely detectable. The craftex ct146 table seems a bit high at 36 1/2", but I've gotten used to it. The rip fence on the craftex ct146 is simply outstanding for a table saw in this price range. I have found it to be very consistent and accurate in a year of heavy use and it has never needed any adjustment since the first day I set it in the rails. The magnifying cursor is a big help in setting the fence accurately. It glides easily across the table and when lining up the cursor to the tape, a light tap or two is all that's needed to hit the mark. There is a micro adjustment thumb wheel, but it doesn't work very well. The fence uses a spring loaded locking mechanism that clamps to a rail on the back of the saw. Once its clamped down, nothing short of a sledge hammer blow is going to move it. I wasn't crazy about the plastic locking handle when I first saw it, but it's a lot stronger than it looks and has never given me any trouble. When set up according to the manual, the fence has a rip capacity of 36". The rails could easily be moved to the right of the saw to increase the rip capacity by loosening the rail bolts and sliding the rails over. You'd lose the ability to read off the tape though. I can consistently repeat a set-up within a few thou or better with this fence using nothing more than the cursor and my eyeballs. I did take the time during assembly to make sure the fence was accurate with the tape, and it's paid off. One of the features I like is the 4 t tracks that run the length of the fence, one on each side and two on the top. I use them frequently for attaching jigs and an auxiliary fence for cutting rabbets. The craftex ct146 was set up pretty nice at the factory and made beautiful cuts right off the bat. I waited a week or so to let the saw settle in before giving it an alignment inspection and checking it over for loose bolts etc. Checking arbor washer runout with a dial indicator and stand. I used a dial indicator to check for arbor runout and found it to be less than .001", as it barely moved the needle off the zero. The arbor washer never moved the needle at all, not surprising by looking at the nicely ground finish. The blade to miter slot alignment was well within reasonable tolerances at a tad over .001", with the front of the blade being closest to the miter slot. A miter slot to fence alignment check showed the fence to be slightly less than .002" farther away from the miter slot at the back than the front. The dial indicator showed no cupping or bowing of the fence face as it was moved front to back. These are pretty good numbers in my book, so I left the alignment as is. The 6" handwheels allow easy control of the blade lift and tilt mechanisms, which operate quite smoothly. There is a bit of backlash in the tilt control, but it's not excessive. Two convenient allen screws on the table top are used to set the positive stops for 45 and 90 degee. Adjustments for the 45 and 90 degree positive stops are easily accessible from the top of the table by turning a couple of allen screws in or out as needed. I find the positive stops on the craftex ct146 to have a bit of a mushy feel to them, caused I think by flex in the table saw's metal body where the tilt control handle is mounted. Since I always set the blade with a square anyway, this is of little consequence. 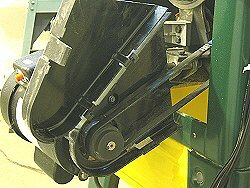 The lock lever for the blade tilt is located just above the blade lift handwheel. I've never had a problem with the blade moving once the lock is on, so it seems to work quite effectively. The lock for the blade lift is a thumbscrew located in the center of the lift handwheel. Although it looks a bit inadequate, the blade has never moved once the lock was tightened. Craftex rates the motor for the ct146 at 1 1/2 hp and it seems to have plenty of power for a contractor saw. The motor comes prewired for 110v, but can be rewired to run off 220v if desired. The machined pulleys and poly-v belt help eliminate vibration. To connect the motor to the blade arbor, craftex has employed a poly-v type belt with machined pulleys, much like the fan belts on newer cars. This is something usually only found on higher price machines or available from aftermarket sources as an upgrade. The advantages of this type of belt system are longer life and much less vibration. A plastic belt guard covers everything up neatly. Because the switch housing plate mounts to a t track on the back of the front fence rail, it can be positioned anywhere along the rail to suit different preferences. I've mounted mine to my left, where I can easily shut it off with my hip or knee if the need arises. The blade guard assembly includes a splitter and anti-kickback pawls for safety. The unit is attached with a single thumbscrew which makes it a snap to remove and install. A plastic shroud on the access side of the blade directs the sawdust to a 2 1/2 " dust port located just under the back edge of the saw's body. It's a fairly decent set-up that catches most of the sawdust when hooked to a shop vac. The 40 tooth carbide tipped blade that comes with the craftex ct146 is fairly decent enough for general work, but I would advise using a thin kerf ripping blade for ripping thick hardwoods. 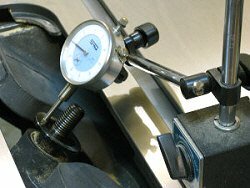 The ct146 comes with a full size miter gauge with adjustable positive stops for 45 and 90 degree angles. It has a disc on the end of the bar that fits in the t slots in the table saw's top. Like most stock miter gauges, this one is a bit sloppy. I really enjoy using the craftex ct146. It's accurate, dependable and allows you to make efficient use of your time in the workshop. That can't be said of all contractor saws in this price range, especially when it comes to the fence. 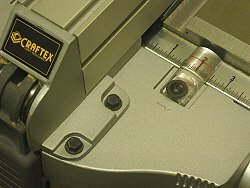 The craftex ct146 comes with many features usually found only on higher end contractor saws that cost hundreds of dollars more. For the price (I paid $570.00 CDN on sale), it's hard to beat. After a year of fairly heavy use, I have encountered no problems with the saw. This includes a couple of full days resawing a load of rough birch I got a super deal on. The saw has never complained once and neither have I.
Craftex CT086 6" wood jointer review.